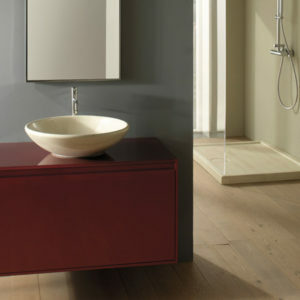 Bjhon washbasins are the fruit of an idea conceived by Angelo Mangiarotti in 1970. They are made of marble or stone, or using an advanced technological material: Cristalplant® biobased. The truncated conical column can support two different shapes of basin, creating a highly sculptural piece. 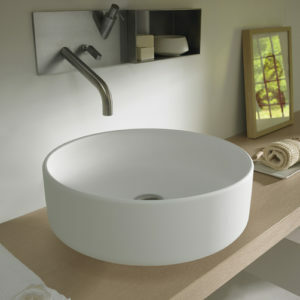 Alternatively, the basin can be set on countertops Flat XL. Bjhon can be placed anywhere you like, thanks to the drain integrated into the column, and the possibility of fitting it on the countertop. 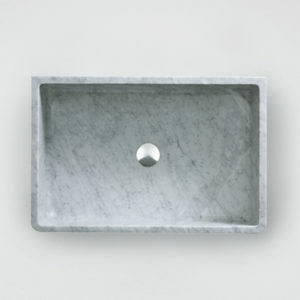 It fits in seamlessly in innumerable different styles and settings, in both versions of the basin, and in both materials: from the purity of marble to handsomely veined stone. It can also be freely combined with different taps and fittings, either free standing or wallmounted, to create a unique ambience every time. 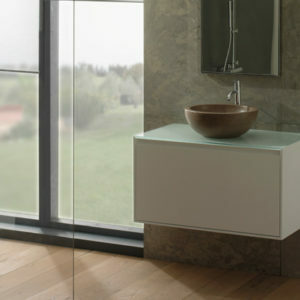 Made entirely in white Exmar, the In-Out washbasin is characterised by a wide circular basin, surrounded by a slim edge and supported by a cylindrical volume. 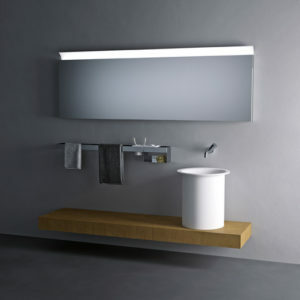 Minimalist yet still a strong feature, the In-Out washbasin is available in different versions: wallmounted, corner, freestanding, on a top or recessed. In-Out, whether recessed or in the version for resting on a top, can be freely coordinated with the tops from the Flat XL and Evoluzione ranges to create always special solutions and settings. 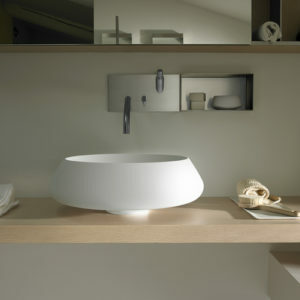 Basin 35 h18 cm. Sit-on installation. Gray peperino or travertine finish. 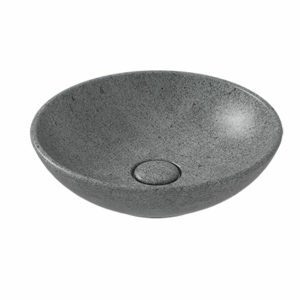 Basin 40 h14 cm. Sit-on installation. Gray peperino or travertine finish. Basin 42cm. Without overflow. Suitable for wall mounted taps or on counter. Sit-on installation. Fixing kit included. 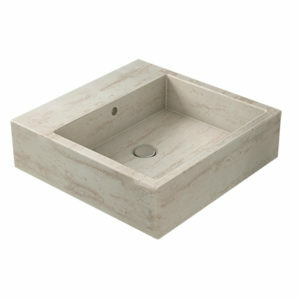 Round basin 50cm. Without overflow. Suitable for wall mounted taps or on counter. Sit-on installation. Fixing kit and ceramic drain included. 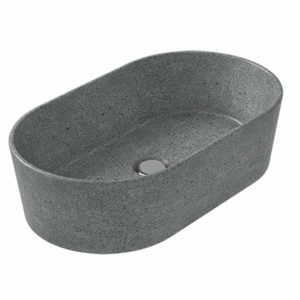 Basin 50.50 h14 cm. Sit-on installation. Fixing kit included. Gray peperino or travertine finish. 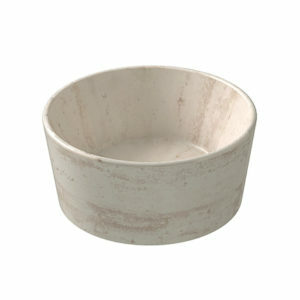 Basin 60.35 h16 cm. Sit-on installation. Gray peperino or travertine finish. 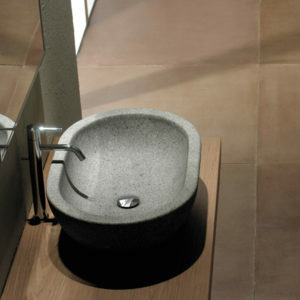 Basin 60cm. Without overflow. Suitable for wall mounted taps or on counter. Sit-on installation. Fixing kit included. 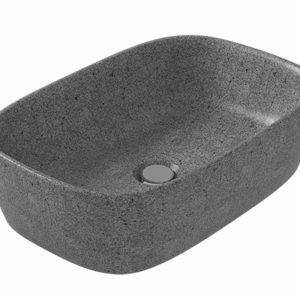 Basin 60.40 h15 cm. Sit-on installation. Gray peperino or travertine finish.